Outdoor sports and any activities outdoors is definitely a good way to keep yourself fit, active and maintain a healthy lifestyle overall. When it comes to such matters, however, it is important to judge and decide which sport is better or more beneficial, as it turns out, not all activities provide the same benefits. Given a choice between jumping on a trampoline or hunting, we can definitely take an easy stand here as the answer is actually pretty simple. Now, you may love to hunt, and it might be your thing, but if you want to decide which option makes a better outdoor sport, then the trampoline is the winner that gets to keep the trophy. If you’re still not convinced as to why jumping on a trampoline fares better as an outdoor sport compared to hunting, then allow us to show you. Here are all the reasons that will portray exactly why trampoline is so much fun compared to hunting. Let’s see what your opinions will be after this! The fun factor- Let’s admit it, although hunting can have a certain amount of thrill to it, the trampoline is all about fun. Stealth and patience are what you need to be hunting successfully, and a lack of these factors will earn you nothing. But when it comes to trampolines, there’s no right or wrong. If you consider trampolines, however, you need nothing fancy to get started. All you do is get up on it and jump as much as you want. And that should do the trick. The best thing is that you won’t need to sit around as jumping will definitely burn off a lot of calories and make you sweat a lot if not anything. Don’t you think it is a better sports option then? We definitely think so. An innovative way to exercise- you think hunting burns off those pesky fat rolls in your stomach or magically vanishes those bulges? Well, jumping on a trampoline definitely does. Trampolines won’t let you remain in a place for long, and the way you keep on jumping and moving will make you sweat without you even noticing it for a moment. After every fun session, you will definitely feel the difference as you’ll feel more active and light. Safety issues aren’t really necessary all the time- hunting may be very adventurous and keep you on your toes all the time. The very idea of maintaining stealth all along the hunting episode may be nerve-wracking enough, but there are moments where your personal safety becomes an issue. Hunting dangerous animals may feel challenging and make you feel very powerful, but you better remember that it is done at the cost of your own life. Are you really safe? Having safety gears don’t really guarantee safety, however, if you jump on the trampoline, it is fairly safe. At least you don’t have any risk of being shot or being eaten by a wild animal when you’re up on a trampoline! No cruelty to animals– jumping on a trampoline doesn’t harm anyone. Be it your neighbor next door, or a poor animal on the brink of extinction. Yep, if you are someone who doesn’t want to hunt animals for the sake of entertainment, or hurting any creature as a sport, then hunting isn’t for you. On the other hand, consider jumping on a trampoline for a change. Are you harming any animals? You be the judge here. Cost of gears/equipment to start the sport- What do you think you have to spend upon for a trampoline? Well, get one of the sizes that you want and pick a suitable spot to place it in. you need no extra items to get this sport started. On the other hand, think of getting ready to hunt. What do you think you need? Starting from the appropriate rifles/guns, scopes, binoculars, rangefinders, cameras, to every other extra item, you actually need a lot of items appropriate for hunting, before you can go and get working. 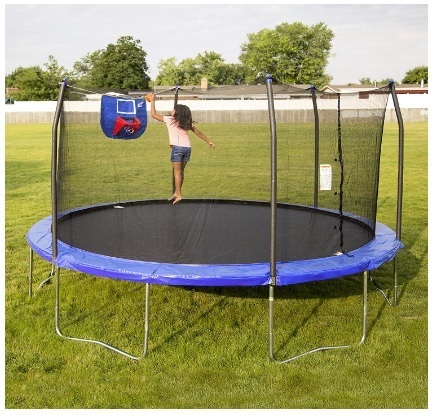 For trampolines, though, all you need is a trampoline of the right size and that’s all! Age restrictions and suitability- it is actually quite easy to distinguish age restrictions and suitability when it comes to such sports. Children and underage people can’t really participate in hunting activities due to the very nature of such a sport. On the other hand, trampolines don’t really need any specific age requirement as long as someone is old enough to be able to jump, or can enjoy the sport wholeheartedly without injuring themselves. So there you have it, trampolines don’t have age restrictions like hunting. Less stressful and no specific skills required- trampolines don’t pose any challenge and so they are a lot less stressful. You also don’t need a ton of expert skills as you need for hunting, and so anyone with minimum to no skills can enjoy their time on a trampoline. Location and travel- This is pretty self-explanatory. You can place a trampoline in your back yard, but for hunting, you need to travel to different locations. So, the latter is a more expensive option compared to jumping on a trampoline, right? Ease of getting equipment- obtaining a trampoline is much easier than obtaining hunting gear, especially outside the US. There are various policies that restrict the access to rifles, even if it’s for hunting. In other cases, hunting itself is illegal in many parts of the world. So, if you think about a trampoline, there aren’t their many restrictions there, is there? Attaining new skills- while this may be true for both trampolines and hunting since hunting teaches you shooting skills, or target shooting and stuff, trampolines, on the other hand, can actually make you more flexible and acrobatic. Besides burning fat and making you more fit, being flexible or getting better at keeping your balance is the main goal of outdoor sports. Luckily, jumping on a trampoline ticks all the boxes when it comes to outdoor sports. As for hunting, well, there’s simply a lot of things that need to be done while you’re at it, and this simply makes trampoline a better option.